Cauliflower is the new kale. Could it be? Let’s discuss. In previous posts, I’ve sung high praises regarding the versatility and chameleonic qualities of my fair-haired cruciferous friend. Milder than its broccoli cousin, cauliflower flocks the entire texture spectrum, spanning from a prodigious, burly whole-headed steak to a delicate, fine grain of pulsed couscous. These extremes are certainly fun, but I have to say that my favorite treatment lies in the equilibrium: regular oven-roasted florets. Because when they are good, they are soooo good. 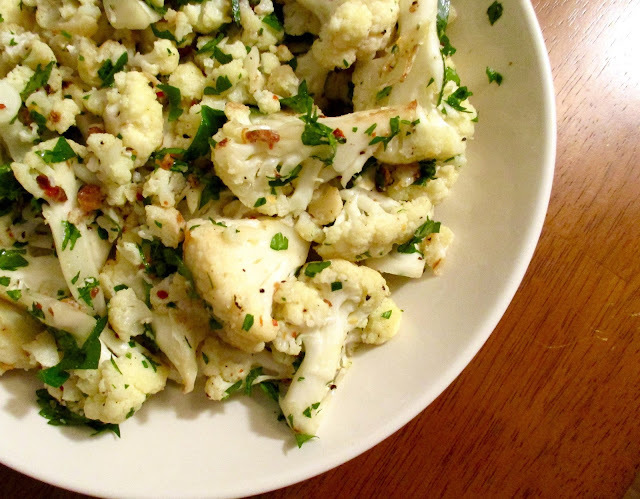 Cue Gjelina’s Roasted Cauliflower with Garlic, Parsley & Vinegar. In the way that certain vegetables become hipsterishly fashionable (yes I’m talking about you Brussels sprouts, nestled smugly on the menu in between the hand-cut bacon cheeseburger and casual avocado toast), cauliflower is slowing rising up in the ranks of popular vegetable starters and sides that people can just NOT.GET.ENOUGH.OF. “OMG did you try the cauliflower at X?” someone will shout, eyes wide. “No, I can’t get a reservation until 2019 but I heard it’s AMAZING,” is the breathless reply. And so, cauliflower climbs the predictable curve of the HFV (hipsterish fashionable vegetable, that is), basking in Hollywood glory at its peak until it meets the inevitable fate of the kale Caesar salad and homemade brioche croutons. (I know it’s no longer a new phenomenon but is it really necessary to get angry when you see it on the menu? Let’s think about this rationally). Sadly, this newfound stardom means that cauliflower will encounter dressings of questionable nature—in relation to health, that is. Swimming in oil or butter, or worse, dare I say bacon (please let this be the one vegetable that avoids the porcine food trend, please!) ensures that even the pickiest of eaters will enjoy the cool cruciferous. But this treatment is a cheat. Garbage bags would be tasty if roasted in copious quantities of various fats. We must let the cauliflower speak for itself! Which is why you might be surprised that the it recipe I can’t stop raving about is unabashedly simple. Five additional ingredients. 13 minutes total cook time—aka speed of light in vegetable roasting years, where 45 minutes is considered quick. And still, it manages to emerge beautifully charred, slightly crunchy, and impossibly moist, with a touch of salt and oil that enhances instead of overpowers. And then there’s the matter of the garlic confit. Slow-roasted whole garlic cloves swimming in a sea of olive oil and perfumed thyme sprigs and bay leaves, these tiny half-moons unapologetically burst with herbaceous flavor, immediately transcending your everyday garlic clove to an enchanted garden, riddled with flavor subtleties of grassy and botanical notes. Make a whole batch, it will keep in your fridge for 2 months—and I dare you to go back to regular garlic ever again. So, I think I answered it—yes, cauliflower is definitely the new kale. Enjoy it while it’s trendy, enjoy when its long forgotten. But if you stick to this recipe, I doubt that will ever be the case. 2. 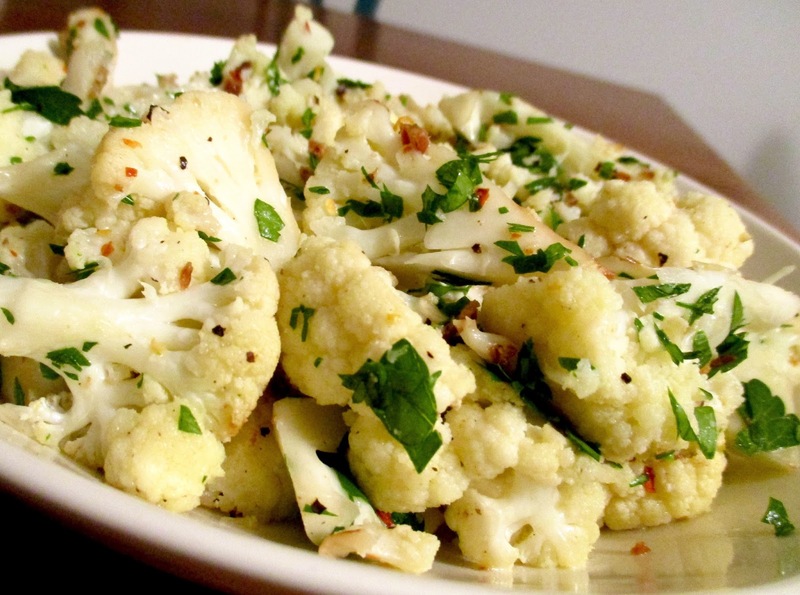 In a medium bowl, toss the cauliflower with the olive oil and season with salt and pepper. 3. Heat a large cast-iron* frying pan over high heat. 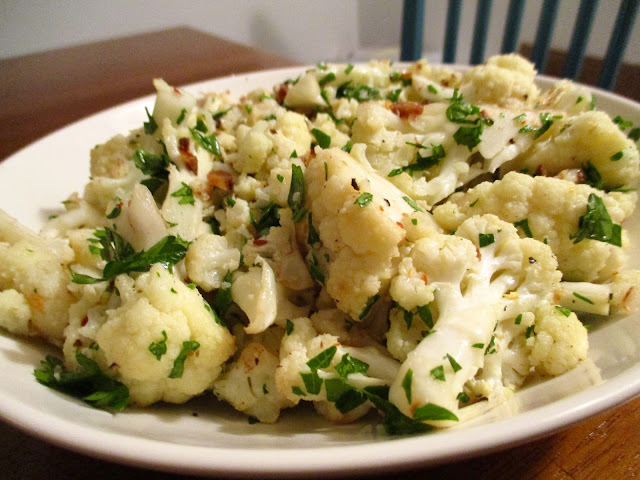 Dump the cauliflower into the hot pan and cook until starting to brown, about 3 minutes. Transfer the pan to the oven and roast the cauliflower, undisturbed until well seared, about 5 minutes longer. With a spatula, turn the cauliflower and cook on the other side until well seared, about 3 minutes longer. 4. Remove from the oven, add the garlic confit, parsley, red pepper flakes and and stir to distribute the seasonings and toast the garlic slightly. Season with salt and pepper. 5. Transfer to a serving platter. Serve warm or at room temperature. *If you don’t have a cast-iron frying pan, use a non-stick skillet instead. When cauliflower is ready to go into the oven, transfer to an oven-safe baking sheet lined with tin foil and a light mist of olive oil so it doesn’t stick. 2. 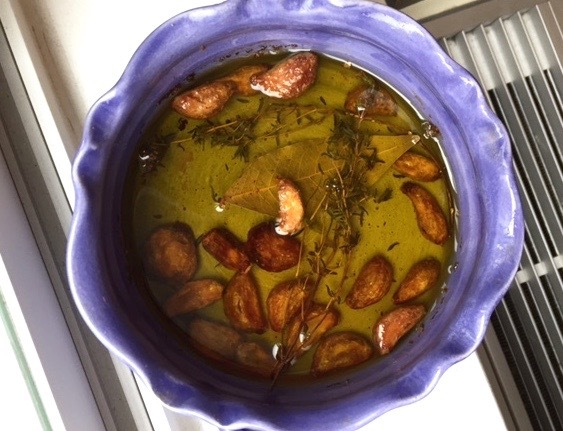 In a medium baking dish, combine the olive oil, garlic, thyme, and bay leaves. The garlic should be completely covered by about 1 inch of oil. 3. Bake until the garlic cloves are soft, fragrant, and lightly browned but still hold their shape, 45 minutes to 1 hour. Remove from oven, let cool to room temperature. 4. Store in an airtight container in the refrigerator for up to 2 months, completely covered with olive oil to prevent air from reaching them.